Today Anita Kelsey the cat groomer came to my house to de Matt my extremely matted chinchilla Persian, Lucy. In the past Lucy has only ever been shaved at the vet with sedation as she can get very stressed when being groomed and try to bite. I decided to choose a home groomer this time as Lucy is 17 years old and has recently been unwell. Anita came on time with all sorts of equipment needed to groom Lucy, I found Anita to be very professional, she knew lots about cats and was very loving and calm with my cat. She explained that every cat is different and the time it takes to complete the grooming process can vary greatly, so I could tell this was not going to be a rushed job, luckily it only took her just over an hour for Lucy to get her lion cut and that included breaks in between for lucy to recover. I was able to hold my cat in varied positions because Anita had some amazing wildlife gloves which stopped me getting bitten. Honestly I never thought it would be possible to have Lucy shaved and combed without sedation but with Anita’s expertise it was. If anyone wants to get their pet groomed at home you have to choose Anita, she is truly amazing. I will definitely ask Anita to come in the future to help me keep Lucy’s fur in good condition. If you have found yourself on this page, are a cat guardian who is looking for a Hampstead Heath cat groomer then you have definitely come to the correct place. 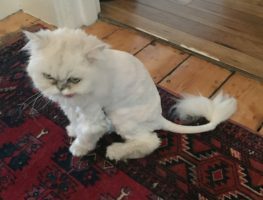 Why does our Hampstead Heath cat groomer stand out? Lucy the cat was happy with her Hampstead Heath cat groomer and you and your cat will be too!